Every year, the brightest agents from all cities across the country are closely considered for the Top 250 Latino Agent award. Each candidate brings a unique story of personal triumph, overcoming adversity, devotion to their trade, and work every day in their local market to make homeownership a reality for families. NAHREP believes in the importance of recognizing such hard working people who make homeownership their personal mission. 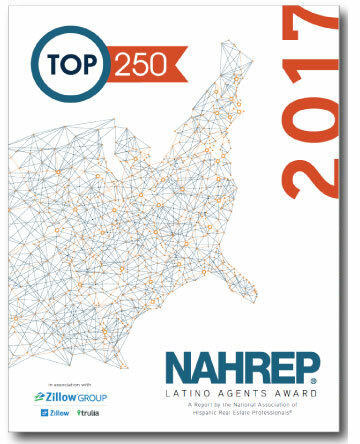 The Top 250 list recognizes agents whose hard work and dedication has led them to close an outstanding number of transactions in an effort to increase the rate of sustainable Hispanic homeownership. This year's group of top performers represent a total of 25,945 sides closed in 2016 and over $6.07 billion in transaction volume. These hard working agents are set apart from the nearly fifty-thousand Latinos in real estate through their dedication to homeownership.